“Being a volunteer in a scientific mission is very simple : You just have to listen to the Project Leader, and you have to be available anytime, sometimes very early, sometimes late. The Project Leader is generally very nice to work with, able to create the right atmosphere for everyone to participate, suggest, and bring his experience/enthusiasm to the mission. In that sense, confidence is the cement of the team. Being a volunteer in a scientific mission when you are a scientist yourself, is a bit more complicated. You are expected to provide advice on organization, sampling strategy, and all your special fields of expertise. But, on the other hand, you are not as involved as the researchers you are working for. A balance needs to be found between helping with all your skills/knowledge, and being too involved. With Mrs Christianen, the balance is easy to find because she listens to her team and she’s open to dialogue. Moreover, she involves all the team to find the best approach. Finally, she knows when it’s time for her to take a decision and make it understandable for everyone. Being a volunteer as a the only freediver within a scuba divers team, is much more challenging. 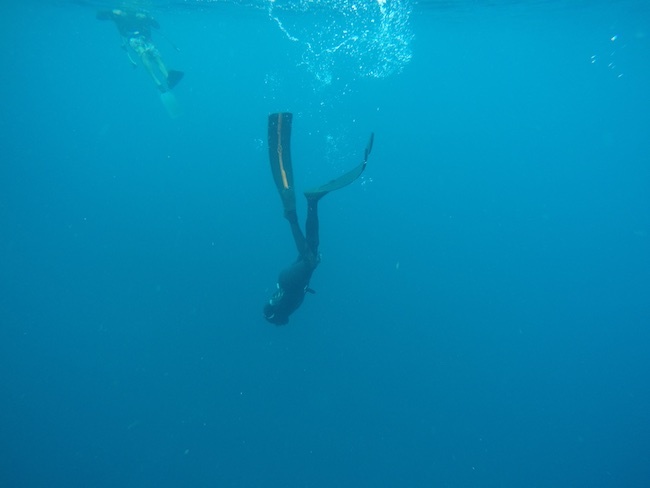 Abilities and limits of freedivers are not always accurately assessed, and for example, when the depth is important, many would consider it would be too deep to freedive. As a result, you have to be patient and, step by step, prove that freediving allow to have efficient and safe interventions and can complement or even sometimes replace scuba diving. 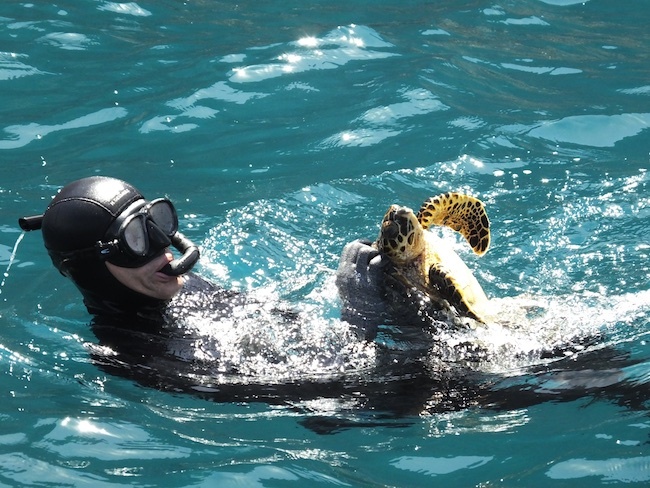 With the University of Groningen, and Stenapa, freediving was not a common practice for catching turtles in “deep” water, between -10 and -25m. We proved, during this mission, that a trained freediver is able to catch efficiently turtles until at least -20 m. For big non cooperative Hawksbill turtles (more than 50kg), the depth of -10m is also possible without being a red line. We proved that it’s possible to catch turtle with scuba diving using a 15l tank in deep water or a pony-tank (5l) in shallower area. And finally, we’ve found some very interesting organization to mix scuba and freediving to catch efficiently turtles in deep wreck (Chien Tong Wreck) : scuba divers catch turtles in deep and sometimes dangerous places for freedivers, and freedivers are used as “elevator” to bring back the turtles to the surface so that scuba divers can continue to work without any risk for the turtles, nor themselves. And finally, being a volunteer when you’re an older ecologist allows you to meet enthusiastic, hard working, younger colleagues. Thanks to them, it helps me to keep the faith in future and believe that this new generation of ecologists will be able to pursue the goal of our generation to better preserve and manage our environment. Sea turtles may have a future.